I have been so busy this week giving new life to some old stuff, that I almost forgot to announce the winner of my four year blog anniversary giveaway...oh silly me! Drum roll please...the winner is...Stephanie at The Driftwood Cottage. Congrats Stephanie!!! 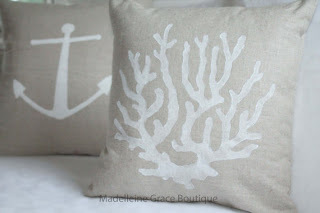 I would like to give a big thank you to Ruth at Madelleine Grace Boutique for sponsoring the giveaway with one of her beautiful pillow covers. See ya Monday at my NIFTY THRIFTY TUESDAY party. Congrats to Stephanie and to you, Linda on your 4th blog anniversary! Beautiful pillows! Too bad I missed the giveaway but congratulations to the winner! Yay!! Thanks so much Linda!